The music ministry of First Baptist Birmingham is centered on these words; we hope to glorify God in our music as we encourage the church, teach one another, and live out the Gospel through worship. We think of worship as a holy banquet of praise for God, and our services reflect a broad range of styles that help our diverse church family sing their praise. We also hope to engage the entire congregation in singing, playing, praying, preparing, and practicing. We understand that the worship service is not a platform for performance, and everyone must offer their own praise to God. At First Baptist you will be challenged to engage in worship, give your best, and lift up the name of Jesus Christ. Worship Choir – The Worship Choir lead in Sunday morning services. The choir family meets on Wednesdays at 6:00pm in the Music Suite. Ministry Highlights: Christmas, Easter, and Special events. Instrumental Ensemble – The Instrumental Ministry rehearses each Sunday morning at 8:30am in the Sanctuary. This Ensemble plays in the 10:15am Morning Worship service. Brass, woodwind, keyboard, percussion, and string instruments are welcome! Proficient musicians from High School and beyond are encouraged to join this ministry. College Ensemble – The College Ensemble is a vocal and instrumental group that leads in services and special mission projects/tours. Student and Children’s Music – Our children’s music is seasonal and coordinated with other Sunday and Wednesday schedules. Special Music – Solos, duets, trios, quartets and ensembles share in the worship services and rehearse at various times. Our minister of music at FBC is Dr. Joe Hopkins. If you would like more information about the Music Ministry, or would like to be involved in these music opportunities, please contact the church office. After growing up in cities all across the USA, I’ve claimed the Birmingham area as my home. 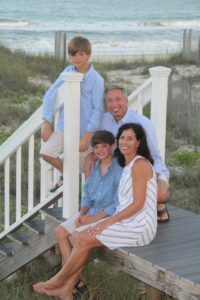 My wife (Suzanne), my two boys (Joseph and Vance), and I have been members at First Baptist Church for 4 years. Much of my week is devoted to my work at Samford University, but thanks to a great worship team of leaders, we are able to encourage a thriving music ministry. My favorite hobby is golf, but since I only play a few times a year, I’m no threat to beat anyone. Like everyone else in Alabama, I enjoy college sports, the outdoors, and good food. Worship at FBC is the highlight of my week, and I am grateful to serve alongside the finest staff anywhere. I hope you will consider visiting FBC and becoming a part of this wonderful family.